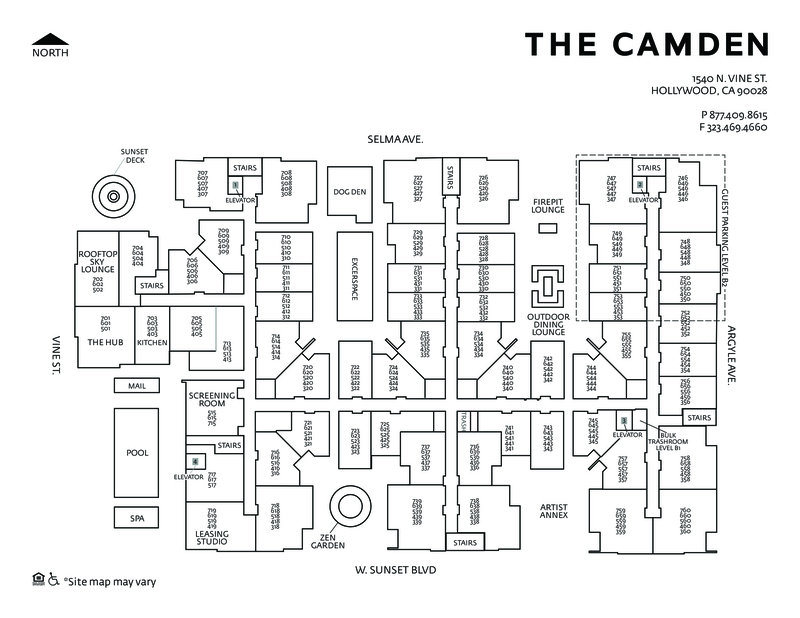 The Camden is a cutting edge, Hollywood apartment offering open concept studio, one, and two bedroom floor plans. The Camden has your lifestyle in mind with top-of-the-line amenities. Relax in The Hub an indoor-outdoor resident-exclusive lounge complete with a gourmet kitchen and heated saltwater pool. Entertain your friends or hang with your neighbors in our interactive Movie Lounge. Dine in The Kitchen, an outdoor dining and gourmet cooking space. Because who doesn't want to eat outside during the gorgeous California weather? Grab your yoga mat and head to The Zen Garden, a quiet, zen-filled area intended for reflection and meditation. Get your blood pumping in The Excerspace, a private, outdoor exercise area. Walk your four-legged roomies in The Dog Den, an exclusive dog park for residents with pets. Park your car in The Garage, a controlled-access parking structure with electric car charging stations on each level. Paint or sculpt and let your creativity flow in The Canvas, a dedicated and quiet art space. Record your first single in the Jam Room, a soundproof space designed for musicians. Gain exclusive access to The Camden Life, resident social events and resident-only discounts to local restaurants and nightclubs. Follow us on Instagram for a peak into the lifestyle you can enjoy as a resident at The Camden. With all of this at your fingertips, you'll never want to leave - except when you workout downstairs after joining the Equinox Club, a 38,000 square foot club with fitness and spa amenities. Take advantage of everything The Neighborhood has to offer, like networking with neighbors & meeting with clients in the Selma and Vine area. Our location removes those physical obstacles that may be keeping your from a balanced lifestyle, putting you in the middle of places for work, fun and relaxation - check out a series of photos chronicling these destinations in Hollywood then and now: A look at how quickly some parts of the neighborhood have changed. Share a street with the classic Dolby Theater—home of the Oscars, and catch a show at the world-famous Pantages Theater. Across the street grab some sushi at Katsuya restaurant and then head over to the rooftop Redbury for drinks and nightlife. Landmarks such as Capitol Records, Paramount Pictures, CBS and ABC TV studios are close to home. Just steps from your door, The Hollywood/Vine Metro Station Red Line is located on Hollywood Boulevard, so getting to work has never been easier. I know what you're thinking - what does The Apartment look like? Each apartment home in The Camden has an open concept floor plan filled with wood flooring throughout the living areas and carpeted bedrooms. The kitchen is on point with two-tone modern European cabinets, large islands with a huge cooking surface, quartz countertops with tile backsplash, and stainless steel appliances. Throughout each Apartment, The Camden offers mid-century modern lighting, energy-saving solar shades, USB charging ports, energy efficiency and water conservation features, programmable thermostats, LED lighting and other environmental conscious practices. All Apartments have front-load washers and dryers and water conserving shower heads and faucet aerators and many have barn doors. When we first opened, we'd been described as "one part luxury apartment complex, one part bed and breakfast, and one part Spring Break retreat," by Curbed. How would you describe us? Craving that feeling that you've 'finally arrived'? We have penthouses as well. Check out The Penthouse and call to ask about availability! We welcome cats and dogs, up to two pets per apartment. Breed restrictions apply. We do not permit American Pit Bull Terrier, American Staffordshire Terrier, Staffordshire Bull Terrier, or any other dog or breed deemed aggressive. Controlled access garage with parking for residents and guests. Studio and one bedroom apartments receive one parking space. Two bedroom apartments receive two parking spaces.